It's a great lies to say that "Suu Kyi has NO power to stop Genocide!" Today so many people are giving reasons to mislead international communities that Suu has no power to stop Genocide or Ethnic Cleansing against Rohingya ethnic in Burma. Their excuses were the Army who have had control defence forces of Burma. It's true that the Army has rights to propose three Ministers but the President has the rights to reject anyone and order the Army to propose another candidate. Well known fact is that Army took forcibly 25% of MPs in legislative power but Suu has more than enough MPs to propose any bill and enact any law, except the Constitution, without partnership with any political parties or the Army's MPs. All of following facts are what she can do according to the current Burmese laws and regulations. 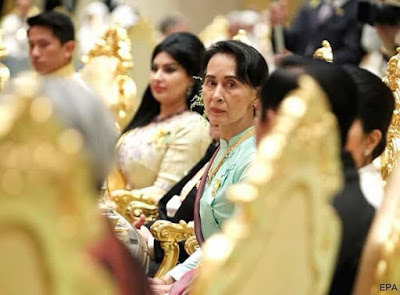 1) She has an authority to recognise Rohingya as one of the indigenous ethnic groups of Burma according to the 1982 Burmese Citizenship Law and reinstate their rights. She no need to change the Law. She can do within weeks like her MPs had enacted the law to create her state counsellor position in 2016 within weeks. Please note that Rohingya have been recognised as an indigenous ethnic group in the period of Democratic civilian U Nu government. Prime Minister U Nu also recognised Mayu District as autonomic region for Rohingya. This Mayu district was directly administered by Central Government. Unfortunately, Dictator General Ne Win became in power 1962. He later abolished Rohingya ethnic rights and autonomic District in his authoritarian rule. 2) She can form a large Emergency Immigration Team to process million of citizenship applications made by Rohingya ethnic. Please note that if they have been recognised as indigenous ethnic group according to above-mentioned Act, Rohingya people will become native citizens of Burma if they can prove that they belong to Rohingya ethnic. This may take some times but she can do within one year because of the previous dictatorship governments have already collected paramount datas for so many years, especially from 1974-2015. It's worthy to mention here that the previous President, ex-General Thein Sein admitted as "After we make ground investigation, there are nothing new comers from Bangladesh (after Burmese independent)." This interview was with VOA Burmese News. And his immigration minister, ex-General Khin Yee also challenged the public who has doubts that there are illegal immigrants from Bangladesh, they should come and check anytime. He told in interview with RFA Burmese News. He also pointed out that in Rakhine state, most of immigration officers and employees are Rakhine Buddhist ethnic." He was right in this issue as there's no single ethnic Rohingya Muslim officer in immigration department. Rakhine authorities, they even have detail lists for animals that were owned by Rohingya ethnic. Suu can mobilise all available officers from every part of Burma to implement this mission. She can request technical and financial assistances from UN and INGO agencies. 3) She has more than enough MPs in Burmese Parliament to propose a bill of Racial Discrimination Act and vote to become a law of Burma. If this Act becomes active Law within one month, she can defeat any racists, religious bigots and trouble makers legally. All of the Judges and lawyers of Burma are within her authority. It's true that she has no direct power over police forces and the Army but she can defeat them, if they create any minor problems, with the supports of lawyers, judges, political activists, NGO, INGO, international governments, UN and most importantly her largest supporters, the People. 4) She has power to make new an agreement with Bangladesh government to bring back all of the Rohingya refugees who have fled from ancestral home lands, Mayu District to Bangladesh because of Ethnic Cleansing. She announced that she will use an old agreement that was made by her enemies, previous dictator General Than Shwe government. She can do this within three months. 5) She has power to grant visas to the members of UN Facts Finding Mission to investigate human rights violations in Burma. They will investigate whether these violations are amounted to Ethnic Cleansing or NOT. This can be done within days. 6) She has power to give permission to National and International medias to go Rakhine state. She should respect freedom of press and allow them freely. But journalists need to agree any risks they may face from insurgents are totally depending on their own choices. She can give order to Minister of Home Affairs to provide security to journalists. If Minister is not agree, she has power to replace him via her puppet President. 7) She also has absolute power to allow any INGOs and NGOs to do their humanitarian works in Rakhine state and allow them to go freely within state. She need to lift any rules that were giving troubles to these agencies such as they need to apply repeated permissions to help who are in needs. She may face some troubles from Buddhist Rakhine who are very hostile to INGO and NGO although they have received more than fair shares from those organisations. But she can get supports from Police forces and media to enforce Rules of Laws. She can also do this within days. 8) She may face some protests for these implementations but she can persuade most of the people with short speech. Today there are a lot of rallies to express their standing with Suu. These will help her a lot. Some people need to be taken as seriously along with Police forces, local administrations, her MPs and part's members, democratic Saffron monks, medias and so on. 9) As she has no power to control the Army, she should agree to talk with ARSA insurgents for peace agreement. ARSA recently released a statement on Twitter, they are ready talk with Suu Kyist Administration for ceasefire. She should not give full authority to Zaw Htay to speak on the behalf of her administration regarding with this issue. Zaw Htay is ex-militant and political critics have suspects regarding with his integrity, attitudes and background. He should be immediately replaced with someone who has reputation, skills and post democratic activist. 10) She should also conclude some portions of Rohingya ethnic leaders as Rakhine ethnic leaders in the Implementation Committee for the recommendations of Kofi Annan commission. In conclusion, she can do most of the above-mentioned facts in short period of times if she is honest and free from racism as well as religious bigotry. Wynston Lawrence is Political Analyst and Human Rights Activist based in Western Australia.